We look at a movie that has become a staple of Found Footage fans! 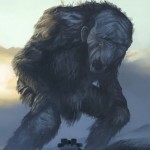 It’s Troll Hunter (2010) from Norway! We discuss this well liked film and do a little listener appreciation shoutouts along the way! Enjoy, and welcome to weekly episodes!